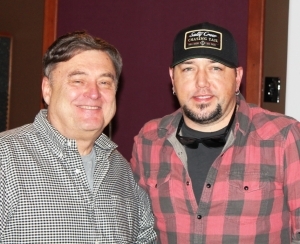 On Monday, Jason and Brittany Aldean welcomed a baby girl to their family. This week Jason co-hosts the Countdown with Lon Helton, and explains how they named her Navy Rome: “Britt & I would put names on a list, and that’s what we did with Memphis. It was the only name we both liked, and was a little different. She wanted to name Memphis: Roman. I was not into that. So when Navy came along, she wanted her middle name to be Rome. I think it’s cool for a girl. So that’s how Rome came into the mix, but Navy was just a name we both thought was cool. Last time he co-hosted, Jason told Lon he had a bowling alley in his house. So now that he sold that house, will his next home have one too? “Of course! We use it a lot. Our house is the hangout. So when we were building our new house, we were like, how could we not have one?” However, they won’t be moving into their new house for at least another year. So besides the bowling alley, what else is Jason building in this new house? “I’m building a pretty substantial lake at the new house. This is where we plan stay a long time, so we’re making sure it has everything we want. It’s where Memphis will fish for the first time. It will be big enough so we can have a boat with a trolling motor in it. Jason also has great stories this week about Kane Brown, Morgan Wallen, Miranda Lambert, and Florida Georgia Line.